“Put them altogether, and you’ve got a Rockbrook…” Well, a granny of course! And not just one, but a couple of hundred! 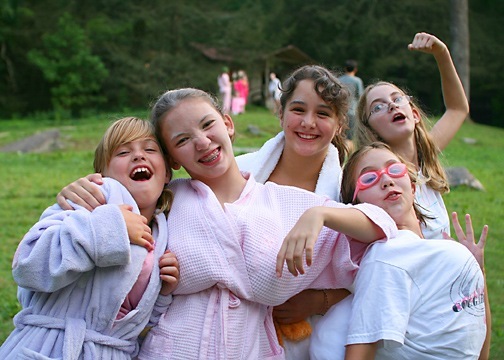 It’s one of our favorite special evening programs at camp— to get dressed up like old ladies and play bingo. “Granny Bingo.” The thrill of the game, the awesome prizes, the costumes, and all the laughing. Sure it’s silly, it’s crazy, it’s goofy, but it’s also excellent fun. 5 Responses to "A Crazy Camp of Grannies"
now thats wot i call funny! Oh wow, that was granny bingo, i remember that, I’m the one in the goggles… aren’t we gorgeous?! Hi Brianna, Pheobe, Elle, Julia, and someone else who is really cool but i dont remember your name!!! Nice grannie “stuffage”!! !